“Ferry Tales” is about the secrets of the Staten Island Ferry Powder Room. It is a place where women of different ages and backgrounds gather every day. 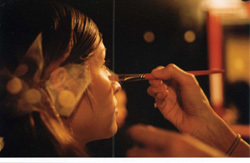 As they put on their make-up and prepare themselves for Manhattan, they are transformed from housewives to businesswomen, from mothers to lawyers, from sisters to socialites. Katja Esson was born in Germany, lives in New York and works in the US and Europe. Since her Bachelor in Motion Picture and Theatre in 1990, Katja Esson is working as a writer/director. 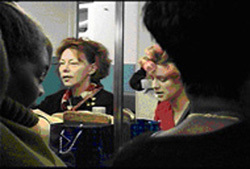 Her 1992 short film “Speech Less” was shown at film festivals all over the world and won several international awards. In 1994 she went on to made her first documentary, “Miami Que Linda es Cuba”, which was part of exhibitions in Museums in Spain and the US, and is now part of the ‘Art on Film Series’ in New York. In 1997 she received the prestigious ‘Master School Fellowship’ in Berlin with her screenplay “El Aleman”. “Sweet Pea Drowning in Frivolity: A Character Study” is a short documentary shot on 16mm film. It is about a cynical young woman whose life revolves around “what’s in,” whether she knows it or not. She is a modern-day slave to fashion livining in Williamsburg, Brooklyn. Narrated by Renee Racicot herself, the piece gives us a humorous glimpse inside the life of a stylish scenester. “Veils Uncovered” documents the reality of sexual competition some women of Damascus live with. Filmed in the Souk Al Hamidiyyah from August to September 11, 2001, it is a personal account of the unexplored sexual world of women who live behind the veil. Independent International Film and Video Festival. Also screening with "White Runway"
Tinker Street, Upstate Films and the Catskill Mountain Foundation Theater are 35mm facilities. Upstate and CMFT will also screen beta sp and digibeta films. Copyright, 2000-2004 - Woodstock Film Festival, Inc.